At least 14 persons, including foreign forces, were killed when a Taliban car bomber struck a US-run NATO convoy travelling through the Afghan capital Kabul today. Syrian tanks pounded an old district in the city of Homs on Saturday and three people were killed, activists said, after one of the bloodiest days of the seven-month-old uprising. A magnitude 6.9 earthquake that struck off the coast of southern Peru on Friday shook buildings in Lima and injured 83 persons near the city of Ica, civil defence officials said today. Australia's Qantas Airways grounded its entire fleet today over a bitter labour dispute in an unprecedented move, with the government asking a tribunal to stop the conflict which it worries is putting both the airline and the economy at risk. Close on the heels of the US advocating dialogue with the Afghan Taliban, the terror outfit has said that peace talks cannot be held unless Washington abandons its "dual-faced policies" on Afghanistan. Irish poet and human rights activist Michael D Higgins was officially confirmed as his country's ninth president today after a marathon two-day count. A genius for mixing the humanities and sciences coupled with a Svengali-like ability to motivate people powered Steve Jobs's mission to change the world, biographer Walter Isaacson concludes in his exhaustive new study of the Apple co-founder. The attacker detonated his Toyota Sedan car at 11:20 am (0650 GMT) in the southwest of the city, and the area was now blocked by Afghan and international forces, said police spokesman Hashmat Stanikzai. At least ten foreign forces, three civilians and a policeman were among the casualties. "The attack targeted an American NATO bus," said a Western military official on condition of anonymity. "There are 10 or 11 people, mostly Americans," he said, giving the death toll. Spokesman for the interior ministry Siddiq Siddiqui said that three civilians and a policeman had also been killed but he had no information on foreign forces. "It was a huge explosion, I saw at least ten bodies of foreign forces taken out of their capsized bus and evacuated by two helicopters," one witness told AFP at the scene. Thick black smoke could be seen rising from an inferno still burning at the scene, while fire hoses were putting out another nearby, footage on private television channel Tolo showed. NATO's coalition forces were seen tending to at least once casualty on the ground, while fire trucks and ambulances, sirens blaring, were on their way to the scene where one charred vehicle could be seen lying on its side. A spokesman for NATO's International Security Assistance Force (ISAF) said the force could not give further details until further information had been gathered. The Taliban, fighting Afghan and Western forces to regain control of Afghanistan after ten years of bloody insurgency, claimed responsibility for the attack. "A suicide car bomb attack was carried out on a bus of foreign forces in the Dar-ul-Aman area of Kabul," said Taliban spokesman Zabiullah Mujahid in a text message sent to AFP. At around the same time in the eastern city of Asadabad in Kunar province, a female suicide bomber blew herself up outside a local branch of Afghanistan's spy agency, a spokesman for the Kunar provincial governor said. The woman struck outside the local operations centre for the National Directorate of Security (NDS), said spokesman Wasifullah Wasifi. "As a result of the explosion two guards of the operative directorate were wounded," he said. The attacks come a day after the Taliban launched a four-hour long assault on a US-run civilian-military base and NDS local branch in the southern city of Kandahar, the spiritual birthplace of the insurgent movement. Earlier in the week it was announced in Kabul that Afghan President Hamid Karzai would next week give a list of areas in up to 17 provinces that will soon see a handover from NATO to Afghan control as Western governments begin to bring troops home with the overall combat mission due to end in 2014. Syrian tanks pounded an old district in the city of Homs on Saturday and three people were killed, activists said, after one of the bloodiest days of the seven-month-old uprising against President Bashar al-Assad. Activists and residents said Syrian forces shot dead 40 civilians on Friday when they fired on demonstrators calling for international protection from Assad's crackdown. One activist group said fierce fighting broke out in Homs on Friday night between dozens of army deserters and forces loyal to Assad. Seventeen soldiers were killed when the defectors attacked two security posts in the city, it said. The report by the British-based Syrian Organisation for Human Rights highlights the emerging element of armed insurgency alongside mainly peaceful street protests demanding an end to 41 years of Assad family rule. The United Nations says 3,000 people, including nearly 200 children, have been killed in the unrest. Since the start of protests in March, Syrian authorities have blamed the violence on gunmen they say have killed 1,100 soldiers and police. 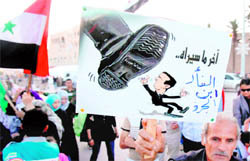 Syria has barred most international media, making it hard to verify accounts from activists and authorities. At least 88 homes were destroyed and another 40 were declared uninhabitable as a result of the quake, though no deaths were reported and big mines in the region continued to operate normally. The US Geological Survey said the quake, initially reported at a magnitude of 7, was centred under the sea 50 km southwest of Ica, near where a devastating magnitude 8 quake killed more than 500 people in 2007. Those injured in Friday's quake were mainly treated for bruises and fractures caused by falling debris. Tens of thousands of passengers, including 17 world leaders, were affected by the abrupt decision, which clearly took the government by surprise. It came as an embarrassment for Prime Minister Julia Gillard who was hosting a Commonwealth leaders summit in Perth, 17 of them booked to fly out on Sunday with Qantas. Unions, from pilots to caterers, have taken strike action since September over pay and opposing Qantas plans to cut its soaring costs, as it looks at setting up two new airlines in Asia and cutting back financially draining long-haul flights. It plans to cut 1,000 jobs and order $9 billion of new Airbus aircraft as part of a make over to salvage the loss making international business. "They are trashing our strategy and our brand. They are deliberately destabilising the company. Customers are now fleeing from us," Qantas Chief Executive Alan Joyce said. "The unions are sticking by impossible claims that are not just to do with pay, but also to do with unions trying to dictate how we run our business," said Joyce, who estimated the latest move would cost the airline A$20 million a day. The move came a day after shareholders backed hefty pay rises to senior Qantas executives. "On the one hand, it (the US) talks about pursuing peace dialogue but on the other it's seeking to establish permanent military bases in Afghanistan," Afghan Taliban spokesman Zabiullah Mujahid told 'The Express Tribune' on telephone from Afghanistan. "The US is seeking Pakistan's help to negotiate with us, but at the same time, it's pressuring Islamabad to fight (the Haqqani network in North Waziristan)... Unless the US shows its commitment to peace talks, dialogue is not possible," he said, asking Washington to abandon its "dual-faced policies" on Afghanistan. "Michelangelo knew a lot about how to quarry stone, not just how to be a sculptor," Isaacson quotes Jobs as saying in one of the many interviews the Apple chief executive gave himin the months before Jobs's death on October 5. Isaacson's "Steve Jobs" quickly became one of the most highly anticipated biographies of the year after the tech icon, the creative force behind products like the MacIntosh PC, iPod, iPhone and iPad, died of pancreatic cancer. The 571-page volume hit bookstores on October 24 but was released earlier than expected on Apple's iBooks online store and Amazon's Kindle the day before. "Edwin Land of Polaroid talked about the intersection of the humanities and science," Jobs tells Isaacson toward the end, when discussing his legacy. "I like that intersection.There's something magical about that place."